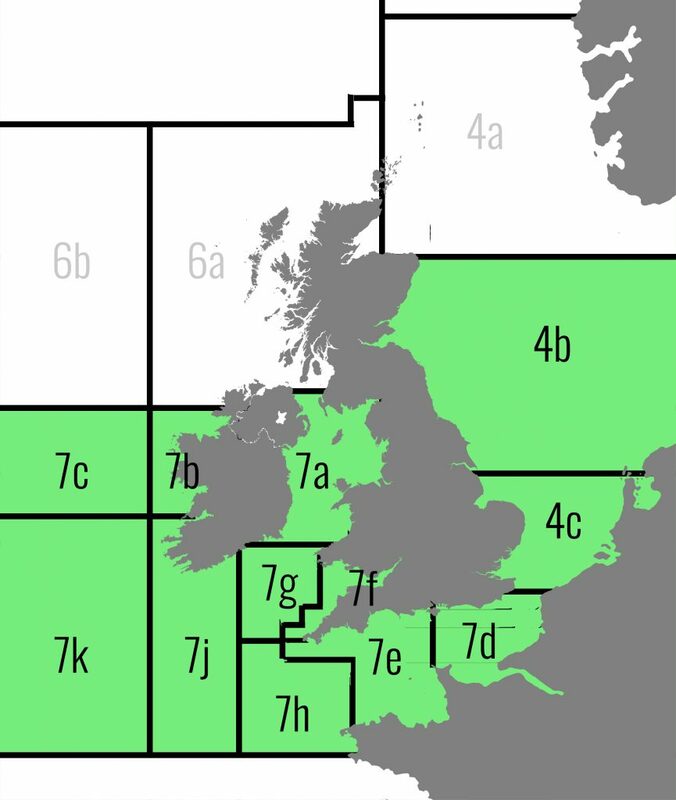 Following an amendment in legislation, anglers will be legally allowed to retain one bass (Dicentrarchus labrax) >42cm per day from October 1st until December 31st 2018 in ICES divisions 4b, 4c, 7a, and 7d–k, which covers the central and southern North Sea, Irish Sea, English Channel, Bristol Channel and Celtic Sea (see below map). Until now, bass have been 100% catch & release only throughout 2018 in these areas. The European Union has accepted updated scientific advice from ICES (International Council for the Exploration of the Sea) relating to estimations that the bass stocks are set to increase in 2018. Vitally, from a recreational angling point of view, the latest ICES advice has also indicated a lower fishing mortality from recreational fisheries and a higher survival rate from the catch-and-release practice (fishing mortality rate of 5%) than previously estimated (15%). As such, ICES has deemed it viable for recreational anglers to retain one bass per angler, per day for the last three months of 2018. Bass will still be catch & release only until 30th September. This change in legislation is set to come into effect across all relevant Member States in the coming days. One of the key points here is the welcome acceptance from ICES that mortality rates (death) of bass from recreational catch & release angling is much lower than they had assumed. This is due in no small way to pioneering studies such as the Irish one led by National University of Ireland Galway (NUIG) and University College Cork (UCC) in conjunction with renowned bass anglers such as Jim Clohessy, who looked at bass residency times and post-release mortality rates in Cork Harbour and found that all thirty fish captured, survived (Doyle et al., 2017). You can read all about this landmark study in issue 16 of the magazine HERE. Whilst many recreational anglers are still rightfully aggrieved that they should be placed in the same category as commercial fishermen when it comes to impacts on bass stocks, this is at least a step in the right direction. An increasing proportion of recreational sea anglers are choosing to catch & release bass (among other species) and are a key stakeholder group in terms of improving conservation efforts for the species. Doyle, T. K., Haberlin, D., Clohessy, J., Bennison, A., & Jessopp, M. (2017). Localised residency and inter-annual fidelity to coastal foraging areas may place sea bass at risk to local depletion. Scientific reports, 7, 45841.